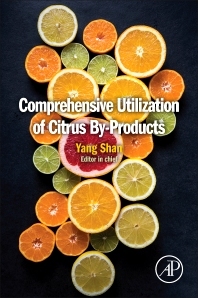 Comprehensive Utilization of Citrus By-products provides comprehensive knowledge and information on the development and utilization of citrus by-products, including the types, preparation, and determination of their main functional components. As one of the most popular fruits in the world, the processing of citrus fruits produces a great deal of citrus peel, a primary by-product. Current treatments of citrus peel pollute the environment and waste resources so eco-friendly solutions are sought. This book reflects research, trends and attitudes in the field, presenting a wide overview including extraction processes for functional components; isolation and structural identification; synthesis of new compounds; and the research and development of citrus by-products, their biodegradable transformation, and processing equipment. This valuable reference book can be used by scientists, scholars, and students working on citrus, dietitians and nutritionists, citrus processing enterprises, and farmers from cooperative organizations related to citrus processing. Ministry of Agriculture. The author has been engaged in the citrus processing research for decades; he has invented plenty of patented technologies and obtained remarkable achievements in the field of citrus processing. One prominent achievement is the invention of method to remove the peel and sac coating of citrus fruits by using enzymatic hydrolysis, which contributes to dramatically improving the quality of Chinese canned citrus.